Low Carb Bounty Bars I love you !!! 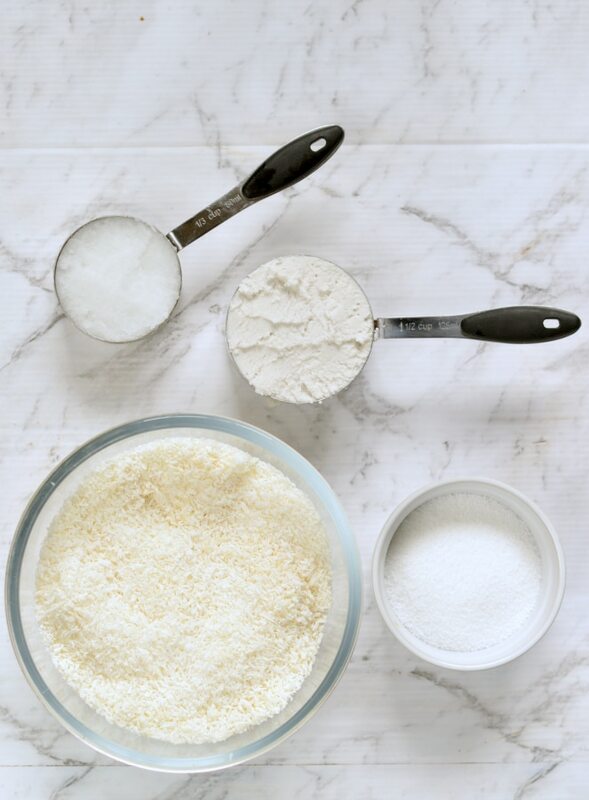 You know how much I love sweet fat bomb recipe to fix my sugar cravings right? 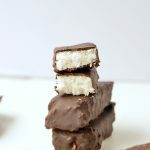 Today I run out of my chocolate avocado cookies and I was craving a Bounty bars – it has always be my favorite chocolate coconut candy bars for a very long time. But since I had diabetes I never enjoyed the taste of a bounty bar. Today I saw the bars at the supermarket, I starred at them thinking ‘can I have one?’. I read the nutrition panel, quickly put it back and go home to make those low carb bounty bars to fix my cravings. 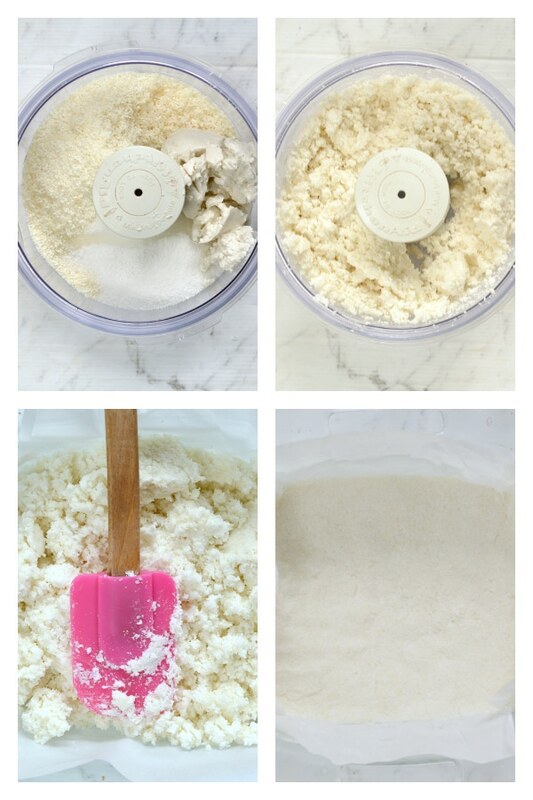 To make those lovely keto bounty bars all you need are 4 simple ingredients that you blend in your food processor for less than 2 minutes ! Coconut cream – I used canned coconut cream, full fat. So yes, those bars are mainly made of fat, healthy fat from coconut oil that I remember is really good if you are on a candida diet too. I struggle with thrush for years, since I eat coconut oil everyday I never experience candida anymore. The other good point about those bars, they don’t contains much calories and they are very fulfilling. 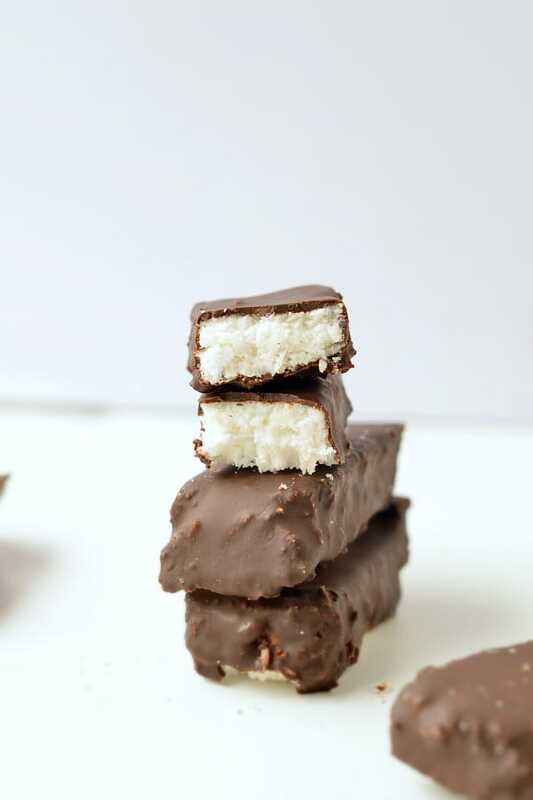 Those low carb bounty bars are soft and sweet as the real bounty bars. If you have a really sweet tooth you can adjust the sweetness with extra stevia drops. The chocolate coating is made of stevia sweetened chocolate melted with a tiny bit of coconut oil. You can use any dark chocolate >78% cocoa powder. Freeze for month : eat them raw or frozen ! I love to freeze those bars for months! It freeze really well in an airtight container or zip plastic bag. You don’t have to defrost them to enjoy. You can also eat them frozen, it makes a delicious bounty bar ice cream. Otherwise, defrost 1 hour at room temperature and they will be as soft and sweet as the day you made them! 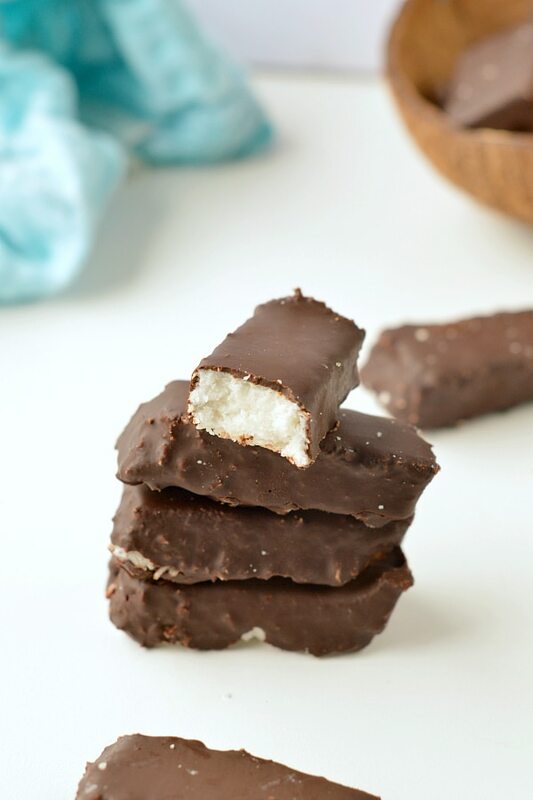 Watch the recipe video and make the low carb bounty bars now ! Low carb bounty bars are raw healthy homemade candy bars 100%Keto + Sugar free + paleo made of 4 ingredients. Cover a square pan of 26 cm * 26 cm (10 inches) with plastic wrap. In a food processor, add all the ingredients except the chocolate coating. Process until it comes together and form a raw cookie dough. Press the dough onto the prepared pan, making sure there is no air left between the batter. I like to press the batter with my hands first and then flatten, smooth the surface with a spatula. Freeze 10 minutes to firm up. Don't freeze them too long or they get super hard and it is difficult to cut them into bars, they break in pieces easily, which is still delicious but less pretty as it is more difficult to shape bars. Remove from the freezer, lift up the plastic wrap to release the coconut bar from the pan easily. Use a sharp knife to cut into 20 small bounty bars. You can slightly warm the knife blade under warm water to make this easier. Meanwhile, melt the sugar free chocolate chips with coconut oil in the microwave. Microwave by 30 seconds burst until fully melted. Add stevia drops to adjust sweetness to your taste. 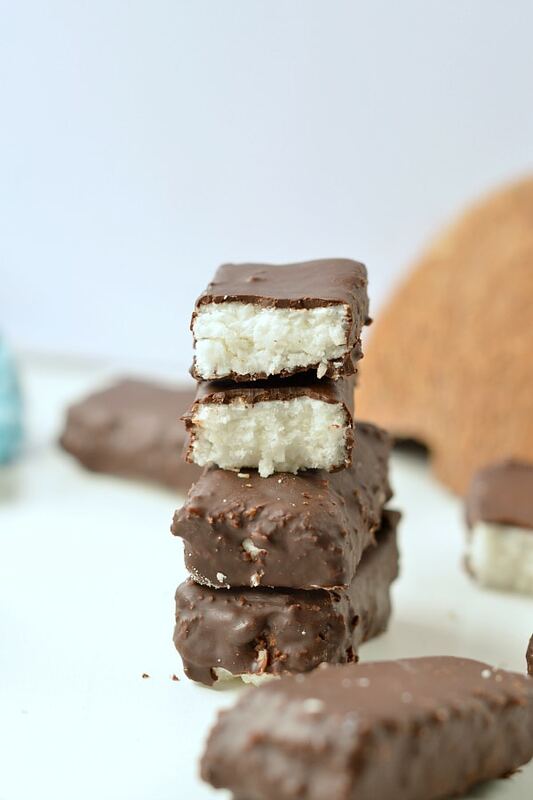 Using two forks, dip each coconut bars into the melted chocolate mixture. Return each to a rack. When all the bars has been covered into the chocolate, freeze again 10 minutes to set the chocolate shell. Store the bounty bars in an airtight container into the fridge for up to 4 weeks or freeze. Defrost 2 hours before eating. Nutrition panel is for one bounty bar. This recipe makes 20 bars. It is awesome that these are sugar free! I would love to try and make these, we have diabetics in the family and I could definitely do with eating less sugar 🙂 Thanks for the recipe. 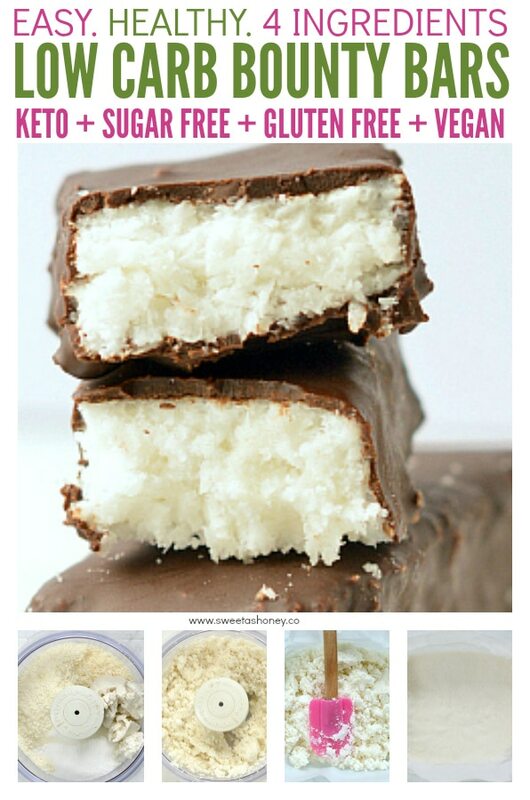 Bounty bars are my favourite treats and this recipe is definitely the best sugar free candy bar ever for diabetic ! Did you try the recipe Karen? I hope you love them as I do! My 2 years old love it and I keep making those little bounty bars each week. Such a guilt free sweet treat! Enjoy. HI Karen, If you look at the recipe I provide the measurement in cups and tablespoons as well. 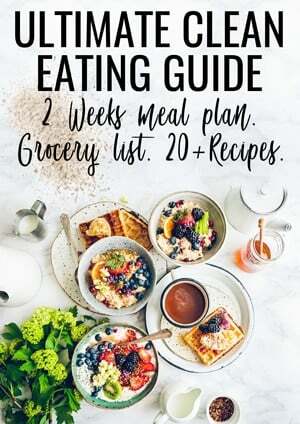 You can easily make this recipe without using grams then. Enjoy! Nutrition panel appears after the recipe box, scroll down to see the full details. Enjoy the bounty bars, XOXO Carine.